Here are the forms and spreadsheet links for Week #4 (if necessary)! Remember that all picks must be in by Monday's market open! <-- TEAM #1 click there to submit your weekly picks for this week! <-- TEAM #4 click there to submit your weekly picks for this week! <-- TEAM #2 click there to submit your weekly picks for this week! <-- TEAM #3 click there to submit your weekly picks for this week! Putting this week's update on HOLD until I can get to the bottom of the data issues with Google Finance. No sense in attempting to update these things when Google Finance's data feed is completely out of whack, which is unfortunately screwing things up with Google Sheets! This goes for the League Challenge as well as the Community Challenge. If I have time later this weekend I'll update these threads, otherwise we might just have to cancel all of this as unfortunate as that sounds. 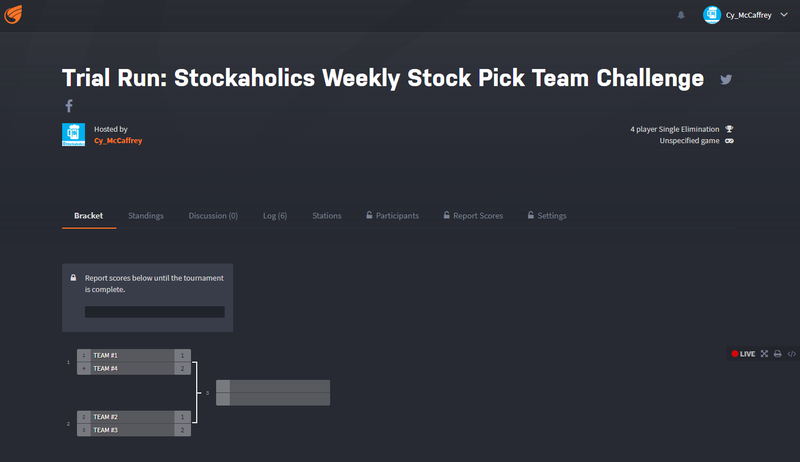 Congratulations to this week's stock picking team challenge winners, TEAM #1 & TEAM #2! TEAM #1 & TEAM #2 stay alive in their series, as TEAM #4 and TEAM #3 now lead 2-1 in this best of 5 weekly series match-up with both teams once again having a chance to wrap up their series next week to head to the final round! Just a quick reminder to all participants that the Week #4 Google Forms and spredsheet links have been posted on Post #23 here in case you guys are looking around for them! Hope you guys can all get a chance to submit the forms so I don't have to do them manually this week. @stock1234 looks like you forgot to submit you weekly picks via the google form for this week for the team challenge, and unfortunately i cannot copy over your picks from the regular weekly contest for this week because one of your picks is a duplicate of @Lico Inv (CHGG - long). thus @Lico Inv you will be going solo for this week against TEAM #3. gl! Haha, not entirely you fault though. I think in the future I will refrain from actively running so many competitions all at the same time. My bad. Pretty sure you and others can relate to this, but I imagine it has to be a little overwhelming, not to mention confusing when you have like, what is it now, 12 different competitions going on simultaneously? Yikes! I think I got a little too carried away with all of them to start this year. For me, whenever I think I have a nice idea for a contest, I always get a little giddy about it and want to trial run it as soon as possible. It was basically the "perfect storm" of ideas if you will, as they were coming in all at the same time lol. In the future, I will just have one contest format outside of our other regular one's running at the same time so it isn't so confusing and overwhelming for everyone. And then once that format has completed, I'd go to the next format, and so on. I still intend to let this "team" format run itself out, but the "league" format will be suspended for sure for right now. I'll run the league format again to its entirety (meaning all 8 weeks from scratch) once things have really quieted down with the number of other contests. Maybe around the summer I guess? Hmm, y'know come to think of it @stock1234 I think I can still add your 2nd weekly pick from the regular weekly contest. I know your CHGG - long was a duplicate to @Lico Inv's but the other was not so let me see if I can just add your other pick...so you'd have at least 1 in there if nothing else. Your XPO - long has been added. Not sure why I hadn't done that originally. Whoops. Same. The smaller the co, typically the less my belief and investment $$ I put in. Just taking a quick peak at the spreadsheets late this morning, it's looking like TEAM #3 will be advancing to the final round, while TEAM #1 looks to tie its series at 2-2 with TEAM #4 to bring it to a 5th and final game. Which would mean TEAM #3 would have a bye week next week while they await the winner of the TEAM #1 vs. TEAM #4 series. I'll have the Week #5 Google Forms and spreadsheet links posted in here momentarily for the TEAM #1 vs. TEAM #4 series.